Just heard that I’ve received a residency fellowship to go to Yaddo for three weeks January 21st -Feb 10 2015. YES! I’ll be focusing on my drawings and prints. The opening reception is May 24, 5-7 pm in the main building of VCFA. exhibit up through June 14. Miriam Sagan Interviews me about my work. See text below. 1. What is you personal/aesthetic relationship to the line? That is, how do you understand it, use it, etc.? 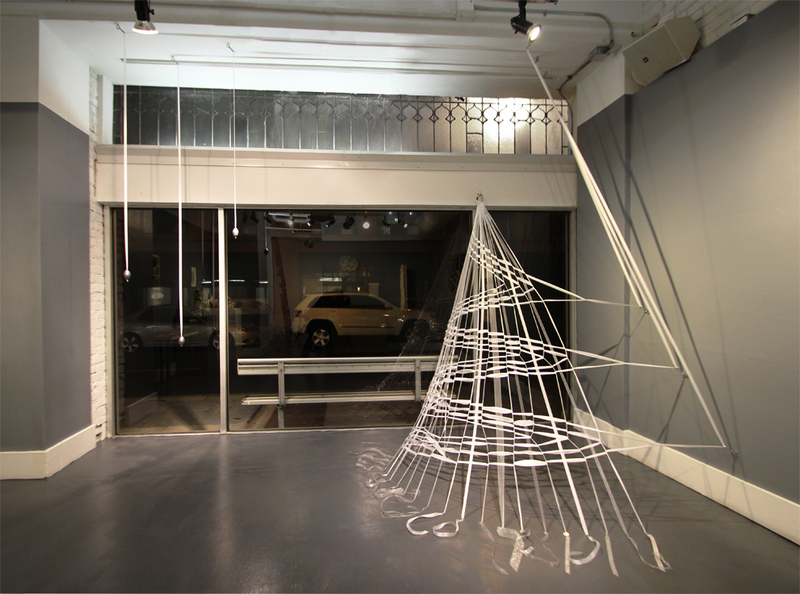 The line is at the basis of all of my work: architecture, printmaking, installation and of course drawings. In architecture when we first conceive of a solid building we explore it’s potential with sketches. As the building design develops we explain our specific ideas for this solid three dimensional structure through a set of construction documents; a series of drawings, slices, differing views, all constructed of lines. In construction we start again with the line as we lay out the footprint of the building’s foundation, stretching nylon cord between wooden stakes. I think of a building as the slow accretion and layering of lines , so dense and full of information that eventually a solid form takes shape. So, I see lines everywhere even within seemingly solid forms. My drawings describe volumes but the character and insistence of the line is always paramount. 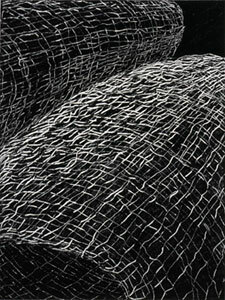 The crocheted installations, some dense, some netted and open, follow from these drawings. What I love about crochet is that my material is a line, a length of rope, which I shape and knot and transform into something three dimensional. I feel like I’m drawing even though I’m working in three dimensions. The most recent crocheted work uses a fillet crochet technique associated with the making of lace. I can make open cells of different sizes, a complex netted structure in which the character of the negative space between the crocheted lines is as important as the lines themselves. Also of interest to me in these works is how a load, in essence the weight of the work, is transferred through these lines as the work hangs suspended in a space or from a building. This weight and the counteracting forces put the line into a state of what architects and engineers call “tension”, and in tension a strong material with a very small cross section can support a great deal of weight. In other words using a line is a far more efficient way of supporting a structure than piling material on material to build a compressive wall or column. So I love how efficient a line is both literally and figuratively. I have developed a new set of prints titled “Fine Cord”. Here I use a literal line, a length of fine nylon, to make the mark in the prints. The texture and character of this cord is transferred to the metal plates with a soft ground technique. I enjoy the layering of perception required when viewing these prints; one sees an abstract graphic line and a literal , represented line, simultaneously. By layering multiple plates, multiple registrations, a mass of color and texture is built up into an image that some have likened to plant forms. The other thing about line is that it embodies movement. When we draw a line, we draw in a direction, our body moves and the line is a record of this movement. I think living in a rural area, I’m particularly attuned to the movement in the landscape: the wind blowing the bare November branches, the snow swirling in funnel forms in a storm, the braided shifting surface of water. The very basic understanding revealed to us through quantum physics is that in all matter there is movement. 2. 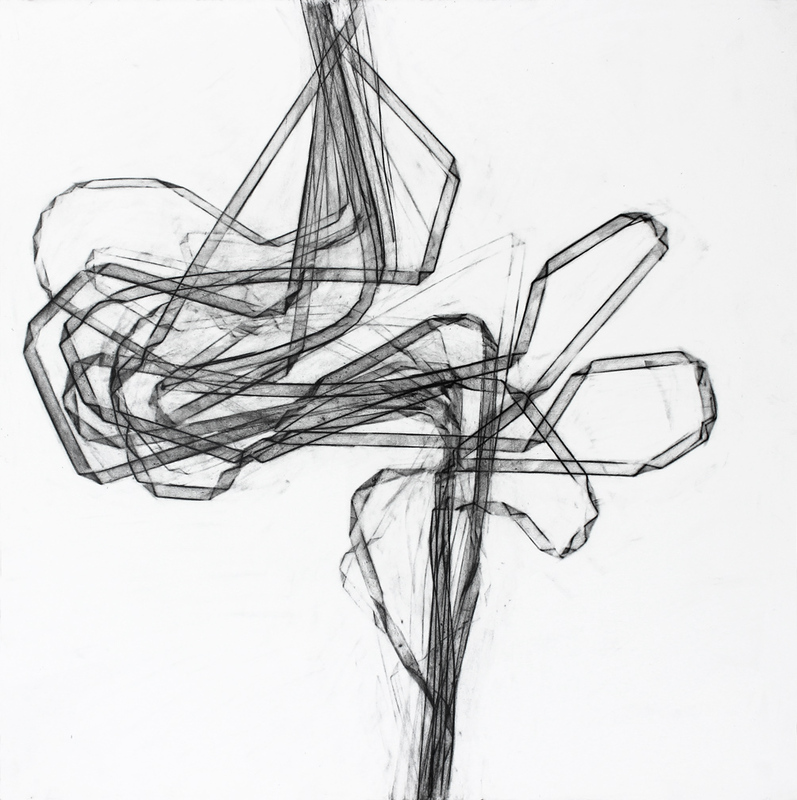 Do you find a relationship between sculpture/installation/drawing and the human body? Or between your art and your body? About 13 years ago I spent a few weeks at an artist’s recidency in Vermont where I had access every day to a figure drawing session with a model. So I started drawing the figure again after what had been a long hiatus. I drew the figure in a way that was new for me; instead of drawings the outlines I saw, I modeled the figure as one might model a landscape in a topographical map or a computer drawing. 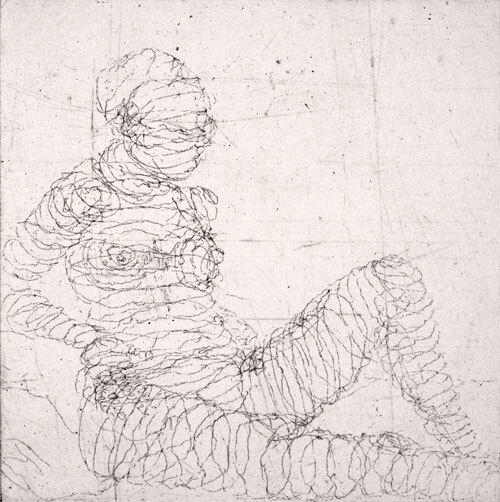 I defined the figure through a series a wrapped contour lines . This experience blurred the distinction for me between landscape and figure and these figure drawings directly influenced my current abstract forms. What I find most difficult and most liberating is that as an artist I must define for myself what I consider success in my work. I’ve experienced many an ah ha moment, moments of clarity, when I know that I have had a breakthrough, an idea for new work or the satisfaction that a completed work has attained all that I might have hoped for it. Those are very pleasurable moments. But there are many other moments when it is easy to doubt ones endeavors, to question the ultimate importance or reason for doing what I do. I wish I could be spared that doubt but stubbornly and with a bit of mischief I continue because I love to define a problem for myself, to follow a path of discovery that is completely non-utilitarian, not a building, not useful in any particular way except that it might affect how people see the world. The freedom that comes from being an artist is very hard to live with but is also indispensable. Wave, particle, Duality VI, Graphite on paper, 12" x 9"
My drawings will be in a three person show at the NAVE Gallery in Sommerville. 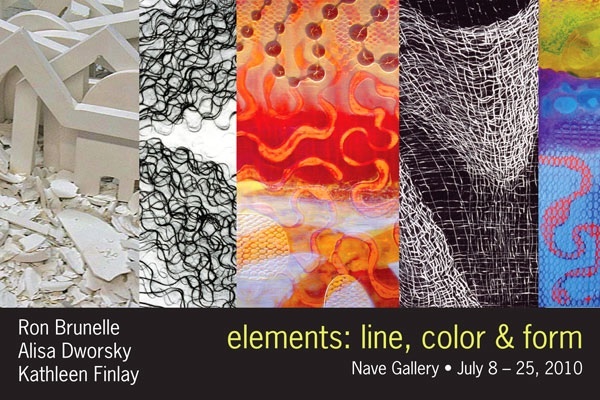 Note that the official opening is Thursday, July 8th, 6-8 pm, but if you attend the Jazz concert at NAVE on June 27th at 3pm you can get a preview of the show. The other artists in the show are Ron Brunelle showing paintings and Kathleen Finlay with an installation. My friend, Paul Kafka-Gibbons will be performing with his group ” Skinny Emu”, an improvisational music-dance-spoken word quartet featuring Paul, Joe Burgio, Andrew Eisenberg and Josh Jefferson. Look for them at 8pm the evening of the opening July 8th. FREE to all.